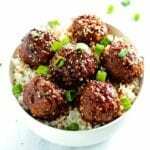 Juicy, flavorful beef teriyaki meatballs. A new twist on two classic dinner dishes. Serve over rice for an easy and delicious dinner. Combine breadcrumbs and milk in a large bowl and let sit for 5 minutes. Add beef, egg, onion, garlic, ginger, soy sauce, and pepper. Mix with hands until combined. Form into meatballs using about 2-3 tablespoons of meat for each. I made approximate 20 meatballs. Arrange meatballs in a single layer in baking dish*. If you are not searing meatballs, skip next step. Place meatballs in freezer for 10 minutes. After 10 minutes has passed, heat a ¼” - ½” layer of oil in a cast iron skillet on medium heat. Coat meatballs in flour and place in oil. Brown meatballs on all sides, about 1-2 minutes per side. Arrange meatballs in a single layer in baking dish. Whisk together all teriyaki sauce ingredients and pour over meatballs. Bake until meatballs are fully cooked, about 40-45 minutes. Let sit for 5-10 minutes. Serve over rice with extra green onions and sesame seeds on top! *I used the same baking dish that I later baked the meatballs in.